Here is the epic life story of the Native American holy man who has inspired millions around the world. Black Elk, the Native American holy man, is known to millions of readers around the world from his 1932 testimonial, Black Elk Speaks. Adapted by the poet John Neihardt from a series of interviews, it is one of the most widely read and admired works of American Indian literature. Cryptic and deeply personal, it has been read as a spiritual guide, a philosophical manifesto, and a text to be deconstructed-while the historical Black Elk has faded from view. 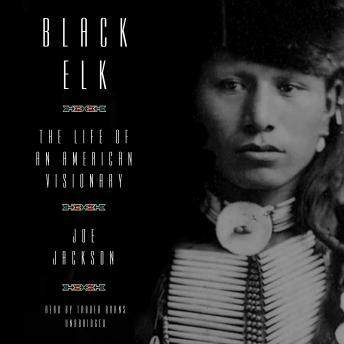 In this sweeping book, Joe Jackson provides the definitive biographical account of a figure whose dramatic life converged with some of the most momentous events in the history of the American West. Born in an era of rising violence, Black Elk killed his first man at Little Big Horn, witnessed the death of his second cousin Crazy Horse, and traveled to Europe with Buffalo Bill's Wild West show. Upon his return, he was swept up in the traditionalist Ghost Dance movement and shaken by the massacre at Wounded Knee. But Black Elk was not a warrior and instead chose the path of a healer and holy man, motivated by a powerful prophetic vision that haunted and inspired him, even after he converted to Catholicism in his later years. A beautifully complete and chronological story of Black Elk and the context in which he lived. Narrated with a respect and understanding that allows the reader to easily emerge themselves in the story. I've never had my mouth agape so much during a book, with a look of horror at the fate of the Oglala Lakota. I believe to be a truly "patriotic" American you must understand where this land came from. How a people were systematically assimilated or destroyed and of those assimilated lived in squaller and often died of disease, famine, or of alcohol related deaths undoubtedly caused by the ripping away of their land and purpose. I've heard many people say it is too "depressing". If you can't hear about it imagine living through it! This is a must read.